How physically-based is the diffuse and specular distinction? The classical way of shading surfaces in real-time computer graphics is a combination of a (Lambertian) diffuse term and a specular term, most likely Phong or Blinn-Phong. Now with the trend going towards physically-based rendering and thus material models in engines such as Frostbite, Unreal Engine or Unity 3D these BRDFs have changed. For example (a pretty universal one at that), the latest Unreal Engine still uses Lambertian diffuse, but in combination with the Cook-Torrance microfacet model for specular reflection (specifically using GGX/Trowbridge-Reitz and a modified Slick approximation for the Fresnel term). Furthermore, a 'Metalness' value is being used to distinguish between conductor and dielectric. For dielectrics, diffuse is colored using the albedo of the material, while specular is always colorless. For metals, diffuse is not used and the specular term is multiplied with the albedo of the material. Regarding real-world physical materials, does the strict separation between diffuse and specular exist and if so, where does it come from? Why is one colored while the other is not? Why do conductors behave differently? To start, I highly suggest reading Naty Hoffman's Siggraph presentation covering the physics of rendering. That said, I will try to answer your specific questions, borrowing images from his presentation. Looking at a single light particle hitting a point on the surface of a material, it can do 2 things: reflect, or refract. Reflected light will bounce away from the surface, similar to a mirror. Refracted light bounces around inside the material, and may exit the material some distance away from where it entered. Finally, every time the light interacts with the molecules of the material, it loses some energy. If it loses enough of its energy, we consider it to be fully absorbed. To quote Naty, "Light is composed of electromagnetic waves. So the optical properties of a substance are closely linked to its electric properties." This is why we group materials as metals or non-metals. Non metals will exhibit both reflection and refraction. Metallic materials only have reflection. All refracted light is absorbed. It would be prohibitively expensive to try to model the light particle's interaction with the molecules of the material. We instead, make some assumptions and simplifications. If the pixel size or shading area is large compared to the entry-exit distances, we can make the assumption that the distances are effectively zero. For convenience, we split the light interactions into two different terms. 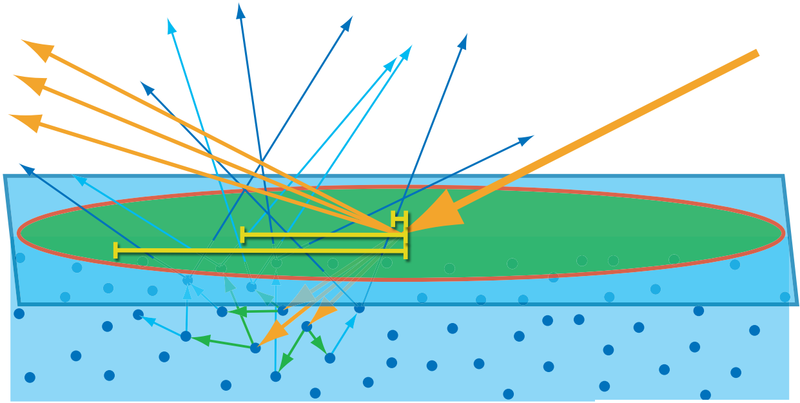 We call the surface reflection term "specular" and the term resulting from refraction, absorption, scattering, and re-refraction we call "diffuse". However, this is a pretty large assumption. For most opaque materials, this assumption is ok and doesn't differ too much from real-life. However, for materials with any kind of transparency, the assumption fails. For example, milk, skin, soap, etc. A material's observed color is the light that is not absorbed. This is a combination of both the reflected light, as well as any refracted light that exits the material. For example, a pure green material will absorb all light that is not green, so the only light to reach our eyes is the green light. I was actually wondering about exactly this a few days ago. Not finding any resources within the graphics community, I actually walked over to the Physics department at my university and asked. It turns out that there are a lot of lies we graphics people believe. First, when light hits a surface, the Fresnel equations apply. The proportions of reflected/refracted light depend on them. You probably knew this. There's no such thing as a "specular color"
What you might not have known is that the Fresnel equations vary based on wavelength, because the refractive index varies based on wavelength. The variation is relatively small for dielectrics (dispersion, anyone? ), but can be enormous for metals (I presume this has to do with these materials' differing electric structures). Therefore, the Fresnel reflection term varies by wavelength, and therefore different wavelengths are reflected preferentially. Seen under broad-spectrum illumination, this is what leads to specular color. But in particular, there is no absorption that magically happens at the surface (the other colors are just refracted). There's no such thing as "diffuse reflection"
As Naty Hoffman says in the talk linked in the other answer, this is really an approximation to outscattered subsurface scattering. Absorption, as in dielectrics, is due to the Beer-Lambert Law. For metals, the absorption coefficient is just much larger (α=4πκ/λ, where κ is the imaginary component of the refractive index (for metals ~0.5 and up), and λ is given in meters). This transmission (or more accurately the SSS it produces) is actually responsible for a significant portion of metals' colors (although it is true that metals' appearances are dominated by their specular). Thanks for contributing an answer to Computer Graphics Stack Exchange! Not the answer you're looking for? Browse other questions tagged physically-based physics brdf or ask your own question. Are there common materials that aren't represented well by RGB? Fresnel reflectance of gold: red channel greater than 1? How to properly combine the diffuse and specular terms? Phong and the Rendering Equation: What's with the cosine? Can an iPhone 7 be made to function as a NFC Tag? In musical terms, what properties are varied by the human voice to produce different words / syllables? Why complex landing gears are used instead of simple,reliability and light weight muscle wire or shape memory alloys?